The main Church of the Transfiguration was built in the 560s, around the time of the Emperor Justinian's death. 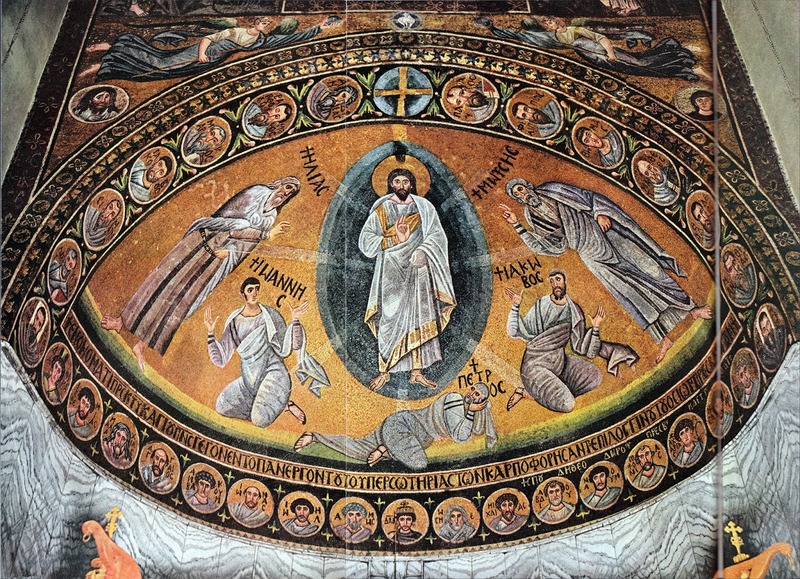 Above and around the scene of the Transfiguration, medallions of the Virgin Mary and St John the Baptist are on either side of the Lamb of God (the Deesis). You will also note the other medallions of holy men and women. "The purpose of the apse paintings was entirely different from that of the nave mosaics, of whose existence most congregants were probably unaware. The nave mosaics were usually devoted to the earthly life of Christ and the saints. The fact that the apse was located behind the altar would almost automatically mean that its theme was associated with the act of worship. Apse pictures are not liturgical pictures even when they depict Christ as a particularly large and isolated figure, as is the case in S. Cosma e Damiano in Rome. Apse images were never worshipped, but they attracted notice, and in some cases they teach the believer how to approach the divine. Cult objects must somehow be accessible to and palpable for congregants, but apse pictures never were. Their function was to direct the congregation’s gaze to the hereafter. The spherical curve of the apse was itself an image of the cosmos. Virtually all apse pictures portray Christ, Mary or the saints with stars, clouds and rainbows on a blue or gold background. Apse pictures were part of the presbytery, which was clearly separated from the congregation’s area in the nave or side aisles. Apse images never tell a story, but instead provide congregants with a glimpse of the kingdom of heaven. Congregants would have found convincing the proposition that, once in heaven, the saints would intercede with Christ and Mary on their behalf. Apse mosaics and their depictions of a Christian ‘Olympus’ were one of the most impressive innovations of Christian art." The scene is the representation of the scene when death was imminent but before the final journey to Jerusalem, he took his three favoured apostles on a spiritual retreat on a mountain. They were Peter, James and John and are shown lying on the ground at the feet of Christ. 33 As they were about to part from him, Peter said to Jesus, “Master, it is good that we are here; let us make three tents, one for you, one for Moses, and one for Elijah.” But he did not know what he was saying. 36 After the voice had spoken, Jesus was found alone. They fell silent and did not at that time tell anyone what they had seen." To prevent any misunderstanding as with the custom in such mosaics and icons of the time, the artist has inserted large inscriptions underneath each of the figures (except Christ) identifying each figure. Moses and Elijah represent the Old Testament law and the prophets. On Mount Sinai both Moses and Elijah received a theophany and a commission. As the heavenly voice indicated, Jesus was the one to be listened to now. One recalls that after his encounter with God, Moses` face was shining, transformed and transfigured that people could not look on him. Two sixth-century mosaics adorn the area above the triumphal arch just in front of the entrance to the Chapel of the Burning Bush. One depicts Moses at the burning bush, while the other shows him receiving the Law on Mt Sinai. The pairing of the burning bush with the reception of the Law reﬂects the transformation that Moses underwent. From most favoured at the Egyptian Court, he gave up his position and wealth to obey God`s command and begin a life of wandering in the desert. He becomes the leader of Israel. He talked with God. "9 There he came to a cave, where he took shelter. But the word of the LORD came to him: Why are you here, Elijah? 12 after the earthquake, fire—but the LORD was not in the fire; after the fire, a light silent sound. 13 When he heard this, Elijah hid his face in his cloak and went out and stood at the entrance of the cave. A voice said to him, Why are you here, Elijah? 15 The LORD said to him: Go back! Take the desert road to Damascus"